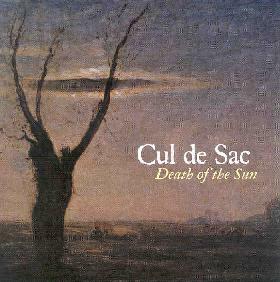 Cul De Sac - "Death Of The Sun"
Death of the Sun, Cul de Sac’s first studio album in four years, is as much a departure from their last studio album as The Epiphany of Glenn Jones was from their earlier works. But that’s easy to understand. With bassist Michael Bloom leaving the band, the remaining members could have done the easy thing, and recruited a similar minded bassist to replace him. Instead, they were determined to re-invent themselves, bringing young musicians Jonathon LaMaster on bass and violin and electronics wizard Jake Trussel into the fold. Trussel in particular brought new ideas of utilizing sampling and looping technology to the band that would turn out to be the key in re-defining their sound. Over the next three years, the band tinkered with numerous field recordings and samples, developing them into sequences which Trussel would manipulate in real-time as the other members of the band worked on building not just a musical accompaniment to the sequence bed, but something that fully integrated the sequences and other (primarily acoustic) instruments into the sound. The result is an astonishing, sonically dense, unpredictable, yet thoroughly engaging musical undertaking. The opening track, The Dust of Butterflies, utilizes samples from a German a cappella recording from the 1930’s, manipulated electronically, pulsing back and forth while LaMaster’s mournful violin melody is joined by Trussel’s melodica with Glenn Jones on a Valco acoustic resonator guitar providing a folksy counterpart. The result is a hauntingly surreal sonic painting of lost rural landscapes, places of crumbling barns, circling crows, grey wooden fences, and abandoned fields. Each piece that follows evokes its own unique world, like the exotic dreamscapes of Bamboo Rockets, Half Lost in Nothingness, Searching for an Inch of Sky, which has Jones playing sitar amidst an quietly hallucinatory atmosphere of field recordings and sampled sequences. Turok, Son of Stone, injects moans, hisses, electronic meanderings and a distant crying horn into an outstanding rhythmic percussion workout from John Proudman, creating a deliciously primeval environment. Electric guitar, violin, and toy piano swirl around each other in the evocative Bellevue Bridge, while Proudman provides some striking, complex percussion, mostly on cymbals. The title track is the most difficult piece on the album (difficult for the band too, as they almost gave up on it several times!). Death of the Sun is a murky and delirious composition that builds from the subtle to nearly symphonic extremes with pounding drums, gurgling and squalling electronics, ghostly violin, and distorted electric guitar, balanced out by melodic acoustic guitar. After that, the final track, I Remember Nothing More, is like some kind of release, as LaMaster’s droning bowed bass is joined by Jones’ bluesy, ruminative acoustic guitar and an ancient, scratchy 78 rpm recording of Salangadou, sung by Adelaide Van Wey. Death of the Sun, the album, took me more than a few listens to begin appreciating its rich textures and profound depth. It is a demanding, highly original, and innovative work that, in the end, is an exceptionally rewarding experience. For more information you can visit the Cul de Sac web site at: http://www.culdesac.org/. Death Of The Sun is distributed by Strange Attractors. You can visit their web site at: http://www.strange-attractors.com.